If you or your loved one is having difficulty sitting in or standing up from your favorite chair, you may want to think about getting a different chair. A 3-position power lift chair may offer the solution you’re looking for–these chairs bring the user all the way up into a standing position and don’t look like medical equipment. For long hours of restful relaxation, choose Golden Tech's Cambridge 3-position lift chair. This model features plush seating and arms coupled with a luxurious, overstuffed "biscuit back" design. The popular, mid-priced Golden Cambridge lift chair comes with an easy-to-use hand pendant that controls the chair’s position. The PR-401 Cambridge Recliner offers assistance and support by providing a full reclining position for napping and relaxation as well as a lift-out feature to aid in standing and exiting the chair, which makes this recliner chair ideal for those with arthritis or other medical ailments. Along with luxurious comfort, a seam-style back design gives this chair an impressive appearance. The Cambridge comes in Golden's super-soft and velvety fabrics with built-in stain defense. The contemporary design of the Cambridge can be easily incorporated into any décor. Standard Fabrics comes in nine colors including Pearl, Sterling and Hazelnut. Valor Vinyl is easy to clean and ideal for incontinence. Comes in six shades. Brisa feels and looks like leather and comes in 10 colors. Brisa Fresco has three colors and antimicrobial, breathable fabric. Besides the contemporary design and many color choices that will allow this chair to effortlessly fit into your décor, the Cambridge offers full-recline positioning, like a La-Z-Boy, with a full chaise (no gap to ottoman) for outstanding leg extension. The biscuit back gives you unmatched support for soft, comfortable sitting and relaxation. Non-skid leg levelers offer extra safety and stability, and the two-button controller is easy to use and reach. 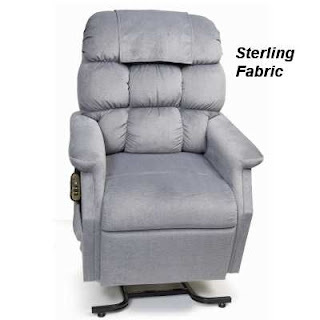 The recliner has a broad choice of positions to choose from including a “full napper” position that is operated by a smooth and quiet lift system. On top of that, the Cambridge has a lifting capacity of 375 lbs. and the best warranty in the industry. With the unique Golden lifting mechanism, this chair will effortlessly take you from fully reclining to a standing position safely and securely. This three-position recliner is equipped to give you years of comfort and durability. 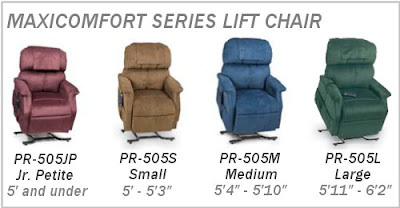 For more information about the PR-401 Cambridge Three-Position Lift Chair visit us here or feel free to call PHC at 866-722-4581. Anyone who has trouble getting up from a recliner or other type of chair will want to check out the PR-505 Maxi-Comfort Lift Chair from Golden Technologies. The smooth motion of this chair makes getting up from a seated position safe, easy and comfortable. If you have avoided sitting in a comfortable recliner because you were afraid that you would not be able to get out of it, then we strongly recommend giving the PR-505 a try. Why Would I Need A Lift Chair? As people get older, they sometimes start to experience difficulties in getting out of soft and comfortable chairs. The end result is that these people are robbed of the chance to enjoy life to its fullest. The strain associated with getting out of a recliner or soft chair can often lead to injuries that can affect your quality of life now and in the future. With the Golden Maxi-Comfort, you no longer have to worry about the strain that can come from getting out of a soft chair. The PR-505 elevates itself to help you get back on your feet with ease, and it’s one of the most comfortable lift chairs we know of! The PR-505 comes in a variety of colors, and free shipping is offered to anywhere in the continental United States. You should also inquire about the extended footrest and massage accessories that will only help to enhance your comfort. This is a real recliner that is a quality piece of furniture. You can get the perfect color to match the rest of your room decor, and then enjoy the benefits of this Zero-Gravity chair. The PR-505 also offers a variety of materials to choose from, including vinyl, brisa, fabric and brisa fresco. You can get the ideal lift chair for your needs that will help you to enjoy the comforts of life without the fear of injury.